The day America became America; free to pursue its right to life, liberty and happiness! American Independence day commemorates the adoption of the Declaration of Independence. For Americans, this is the day they officially left the British empire and became ‘The United States of America’. If America were a son, it would be his graduation day. It is, in it’s own right, a day to be celebrated, and if there’s a day to be celebrated – we’ve got the jewellery to celebrate it with! 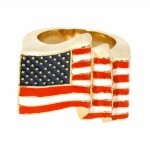 Be it a simple waving flag ring, uncle Sam’s hat or the more detailed American Bald Eagle clutching the symbolic olive branch and three arrows, our pieces are all Gold plated and hand crafted to perfection.